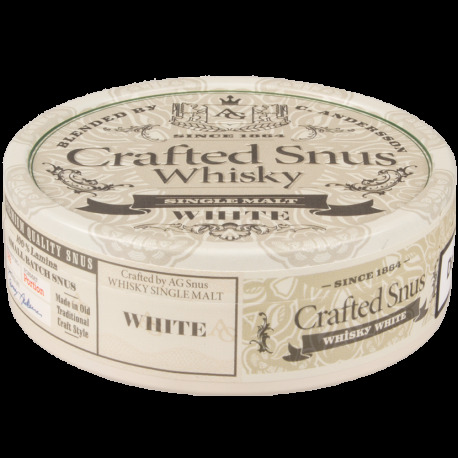 Blended by Conny Andersson and manufactured by AG Snus, this is the latest Whisky snus released and the first under the Crafted Snus label. Premium quality tobaccos, including Mata Norte and Latakia, are matured in used whisky barrels and flavored with a Highland region single malt whiskey, Conny teases out tones of chocolate and walnut creating a one of a kind craft white portion snus. Snus Master Conny Andersson was also the blender of Islay Whisky Snus and the Swedish Match Kardus Superior Editions. The "Crafted Snus" brand is a partnership between AG Snus and Conny Andersson. I haven't tried the original portion yet, but I'm genuinely terrified of being just as disappointed with it as I was with the white portion. A horrible experience for something that's considered top shelf snus. The taste is bearable, but it's hard to justify putting a portion in after opening the can and being punched in the face with that manure smell. It's as close to being in a horse stall or a cow pasture as you can get. Faint smoke and whiskey for 30 minutes - like I have to swish air around my mouth to taste anything - and then drips that taste like acidic piss after that. 1 out of 2 people found this review useful. I too agree wholly with Kim T. but I feel I should share what this snus reminded me of. first off I have to say the can design is beautiful. at least now I have a nice can to keep better snus in. but that's all the positivity I can give. As soon as I cracked this can open I was kicked in the nose with a sharp scent that reminded me of bringing horses in from the pasture after it had rained and they've been playing in the mud. coming out to feed that following morning. imagine the scent of musty humid horse stalls full of dung and urine and the mix of the stale straw that has been soaking it up through the night and the fresh straw you're carrying to replace it with. the flavor reminded me of my sophomore year of high school. that dry stale flavor you have as soon as you wake up the morning after you got wasted on the cheapest whiskey available (growing up on a farm in Kansas, all I could get was Jim Beam and Kentucky Deluxe) and with it you smoked two packs of Marlboro Red 100's. so in conclusion. this snus is ultra dry, smells like a dirty horse stall, and tastes like you smoked a stale cigarette four hours ago and haven't drank any water for five days. recommend? definitely not. not even to my neighbors dog. one star for the can though. Didn't get a whole lot of whiskey, but tons of smoke. I didn't hate it, just not what I expected. Smells and almost tastes like a cigar. The scent is very Monte Cristo. Worth a try, but probably won't reorder. Agree 100% w/ Kim T's review above. This is one of the best Whiskey snus i have had. yes the white portion is dryer than most white portions i have had but i got a really smooth burn and then i got a really nice whiskey flavor. i would recommend this to my friends and family. Really looked forward to this, so I'm a bit crestfallen over how they turned out. Portions are well made, no loose snus in the can. Portions aren't packed full. Easy to break up & evenly distribute the snus inside. White portions I expect to be dry, but not *this* dry. Takes a good 30 minutes to get going. When finally saturated, the drip starts and never lets up. I'm not a fan of overly drippy snus. A little, sure, delivers the flavor to my taste buds. In this case though, it's excessive and off-putting. Salt is high, thus the waterfall drip factor for me, contrasting starkly with what could've been a smooth scotch tone. Its whiskey tends to clash with the harsher tobacco notes, lacking body and depth. Imagine a watered-down, highly salted shot of whiskey infused with astringent tobacco, and you get the picture. I'd like to see a modified blend of tobaccos that lend a chocolate, dark fruit character, and some oak and vanilla, which I feel would lend much needed body to this snus. Reduce the salt so the scotch and richness shines through. I've not tried the original version yet, though I've got a can in the freezer. Hoping it fares better than the white. Overall, I don't really recommend buying this. If you're looking for a good whiskey snus, check out Probe instead. Body, low salt, dark fruits, chocolate undertones, oak, vanilla... It has it all. 3 out of 4 people found this review useful.